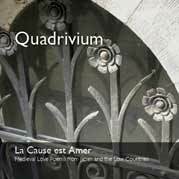 KA003: Quadrivium, La Cause est Amer: Medieval Love Poems from Japan and the Low Countries. "Se la face ay pale, la cause est amer" -- "If my face is pale, the cause is love / bitterness". The double meaning of "amer" offers a medieval acknowledgement that Love is multi-faceted. Never simply just an enjoyable state, it can also induce anxiety, loneliness and grief. This chanson of Guillaume Dufay serves as both the title song and the theme of this recording, which presents 15th-century Burgundian chansons interleaved amongst modern settings of medieval Japanese verses. The program of this recording is comprised of five thematic sets. Each set addresses a different state of love, beginning with a waka from Janpieter Biesemans' suite Vijf Nippon Waka (2002), and followed by with a late-medieval chanson chosen to reflect the emotion evoked by the waka. Several of these chansons are also presented as intabulations, or instrumental arrangements. Compositions by Dufay, Ockeghem, Fontaine, Morton, Binchois, Frye, Buxheimer Orgelbuch, Biesemans. In medieval times the Quadrivium represents the four most important free 'higher' arts (arithmetica, geometrica, astronomia and musica.) The ensemble Quadrivium unites four colors of the medieval musical palette: voice, recorder, harp and lute. With their unique historical instrumentary, Quadrivium connects with the audience with a wide array of delicate instrumental colors, typical for the early polyphony of the middle ages and early renaissance.